Many Indian capitals are rapidly becoming megacities due to industrialization and rural–urban emigration. Land use within city boundaries has changed dynamically, accommodating development while replacing traditional land-use patterns. 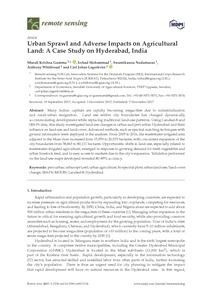 Using Landsat-8 and IRS-P6 data, this study investigated land-use changes in urban and peri-urban Hyderabad and their influence on land-use and land-cover. Advanced methods, such as spectral matching techniques with ground information were deployed in the analysis. From 2005 to 2016, the wastewater-irrigated area adjacent to the Musi river increased from 15,553 to 20,573 hectares, with concurrent expansion of the city boundaries from 38,863 to 80,111 hectares. Opportunistic shifts in land-use, especially related to wastewater-irrigated agriculture, emerged in response to growing demand for fresh vegetables and urban livestock feed, and to easy access to markets due to the city’s expansion. Validation performed on the land-use maps developed revealed 80–85% accuracy.